I just let my son borrow my phone. He asked, so I obliged. It’s locked so all he can really do is make pretend calls while listening to the iTunes feature that pops up automatically, and take pictures of himself. (I’m always a little concerned about the fact that he could theoretically make an emergency call, but hey, every kid has to accidentally call the cops at least once in their lives, right?) So I’m sitting here being super benevolent with this $400 piece of technology, letting him run up and down the hall, and of course he needs to taste the phone, and let the dog have a lick too. And I’m tolerating all of these gross bodily fluids rather well. But then he’s trying to come over to the laptop where I’m writing, and he’s tapping on the caps lock and so suddenLY I’M WRITING LIKE THIS before I realize it, and I change it back. Then he sneaks in a bit of punctuation ‘’’’’’’’’’’’ before I notice, and then I pause, again, to try to distract him. At this point, I’m feeling guilty because this is probably a sign that he needs a sibling or that I am not being the most attentive mother. But hey, it’s also a sign that my child is not terribly socially intuitive. In other words, rude. This morning we ate Cheerios for breakfast. Well, I did. I ate them neatly and didn’t spill a one. John, on the other hand, was inspired. 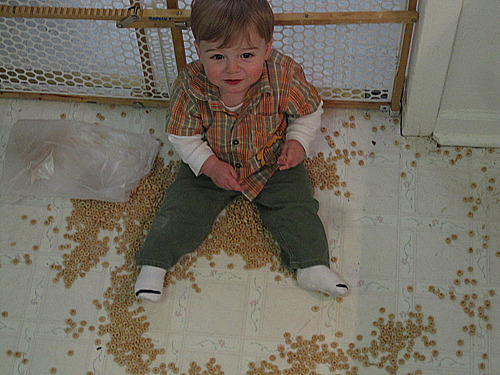 He joyfully slapped and spun a Jackson Pollock with gusto, scattering the hapless Cheerios to the four winds. Soon, the tiny oat circles carpeted the kitchen floor. His attention span for clean up lasts approximately 34 seconds, so I would be the one cleaning it up. I’m sure it was intentional. As my brother and I chatted on Skype today, I gave him a survey of the kitchen floor. He laughed. “Babies have no morals,” I warned. He should know the truth. Sometimes I think, “Where is your mother?” And then, you know, I realize the obvious. That I am the mother, and I really should do something about these tantrums and selfish behavior that would never work on a playground or in a boardroom. Babies are indeed rude. And sometimes, I get upset. A little flustered, frustrated, flabbergasted at the situations I find, we find ourselves in. Rightfully so, I think. There are a couple reasons for this. The foremost, I think, is that I’m simply not used to being treated this way by regular humans in my daily life. Usually my roommates do not run off with dirty dishes, stolen from the dishwasher, begging me to chase them. Most days I am not being assaulted with a spatula or attacked from behind for a hug or piggie back ride. But I never see it coming. Most people do not want to drink out of my beverages, stir the insides or pour them on the hardwood (laminate) and splash in them. It’s absurd behavior. I’m not used to it. The second reason for my more frequent bouts with anger is just the inconvenience of it all. If I’m honest, sometimes it’s out of the frustration for the fact that I am stopping my perfectly reasonable activity to pull an electrical cord out of a mouth, prevent a nose dive off the couch into something thick, solid piece of plastic. Or try to reason with this little wonder about how that toothbrush is yours, not that dogs, and there should be no sharing. First world problems, I know. But these moments of domesticity can try the most patient and peaceable maternal instincts. They bring out the deeply rooted anger and impatience we didn’t know was in us. Really. I had no idea I was an angry person until 1) I got married and 2) I had a child. Parents and married people always said this to each other and nodded knowingly in return. I stared at them from a distance in disbelief. “You people are really screwed up.” It was incredible they didn’t know they needed therapy. But alas, it is true. The rudeness and absurdity and inconvenience of the mess is annoying and angering, but thankfully, I see my true self in it. I would have no idea of these character issues if it were not for my son, and my husband, here to point them out. Thank you, Boys. The hardest, hardest part of all this is not the mess though. It’s realizing that I am the problem. Because indeed I am. My selfishness and small-minded laziness gets me in trouble. They are not pretty, the worst ugly sides of me. My impatience and anger are there in a moments notice when I need them, or rather want them, and where is my patience and grace? Well, I am only now starting to make a practice of using them. This refining process is slow and searing, but it is good. All these little deaths leading me into the reflection of Christ. I know it’s worth it.